Jade Raymond, head of Google's Stadia Games and Entertainment, speaks on stage during a keynote address at the Game Developers Conference in San Francisco, California, March 19, 2019. Google didn't say how much its new service will cost, whether it will offer subscriptions or other options, or what games will be available at launch — all key elements to the success of a new video-game platform. It said only that Stadia will be available in late 2019. 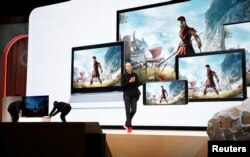 Google vice president and general manager Phil Harrison speaks during a Google keynote address announcing a new video gaming streaming service named Stadia at the Gaming Developers Conference in San Francisco, California, U.S., March 19, 2019. Alphabet Inc.'s Google said playing video games will be as simple as pressing a “Play Now” button, with nothing to download or install. An optional dedicated Stadia controller will be available. The WiFi-enabled controller has a button that lets players launch a microphone and use Google Assistant to ask questions about the games being played. Another button lets users share gameplay directly to Google's video streaming service, YouTube. Google VP and GM Phil Harrison shows off the WiFi-enabled controller that lets players launch a microphone and use Google Assistant to ask questions. Another button lets users share gameplay directly to Google's video streaming service, YouTube. The company said Stadia will be available in late 2019 in the U.S., Canada, the U.K. and parts of Europe. Google showed demos of “Assassin's Creed Odyssey” and “Doom Eternal.” More information about games and pricing is due this summer.